Connie writes: I hid the ticker on Facebook when it was first introduced. Now, I want it back. I’ve searched online, but none of the fixes I found work for me. Just wondering if you may have a solution? Thanks for your help. Hi Connie! Yep, I did the same thing when the Facebook ticker first came out: I switched it off. After all, who needs a constant stream of friend activity scrolling in the sidebar? After awhile, though, I too began to miss it—and besides, it seems that Facebook make a few key changes to its secret sauce for the news feed ticker. No longer a relentlessly marching scroll, the Facebook ticker now sits unobtrusively in the corner of the screen, displaying a handful of enticing news-feed tidbits that I frequently find myself clicking on. Want to hide the Facebook ticker? Just click the Hide Sidebar setting. Anyway, back to your question, Connie: how do you unhide the ticker (which shares space with Facebook chat in the Sidebar)? Before we get there, let’s back up for a minute. OK, so how do you hide the Facebook ticker in the first place? Easily done. Go to the very bottom of the sidebar, find and click the Settings button (it’s the gear-shaped one), then select Hide Sidebar; that’ll make both the ticker and the chat interface disappear. Note: There used to be a “Hide Ticker” option that hid the Ticker without losing the Chat sidebar, but that setting seems to have disappeared (for now, anyway). Also gone: a little divider that you could drag over the ticker, effectively hiding it. Have second thoughts about hiding the ticker? You can get it back with a single click. Just click the “Chat” button the bottom-right corner of the page; when you do, the Sidebar—complete with the ticker—will spring open. Still don’t see the ticker? 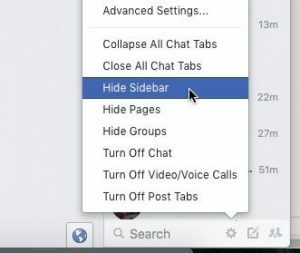 Keep in mind that the Facebook sidebar will hide itself automatically if your browser window is too small. Try expanding the window until the Sidebar appears. Update: Connie wrote back to report that even after following the steps above, she still couldn’t find the ticker. The reason? Hard to say. One possibility is that the ticker doesn’t appear for those with fewer than 100 or so Facebook friends (as is the case with Connie). It’s also possible that her screen resolution simply won’t allow for a large enough browser window. 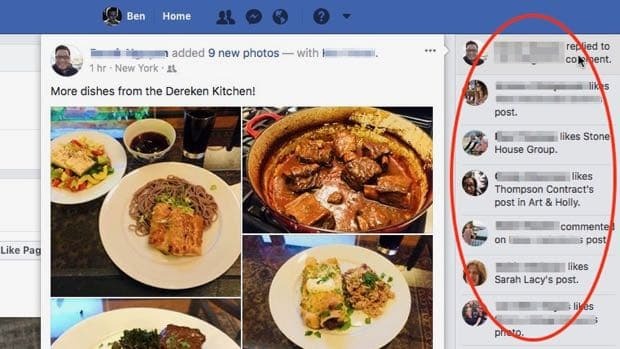 Finally, remember that Facebook is constantly testing, moving, tweaking and removing features, and in some cases only a subset of users may see the changes. Recently (as in November 2017), I’ve noticed that the ticker has been disappearing and reappearing without explanation, even though the chat sidebar is still visible. In other words, if the Facebook ticker isn’t showing up in your browser, you’re probably not alone. For more Facebook tips, click here.